There are countless blender brands out there, but only 4 that matter. Which is best? It should be an easy question, but these days people are PASSIONATE about blenders and are evangelical about recommending 'their' brand to you. Fortunately, I'm emotionally dead inside and don't have strong feelings about kitchen equipment. That's why I'm qualified to stack these brands up against each other and hopefully use facts and logic to see if one stands out from the crowd. Blendtec was founded by Tom Dickinson in 1975, and it still operates in the state where it was founded. They experienced a huge rise in popularity due to the brand's famous "Will it Blend?" campaign. Blendtec's primary competition is Vitamix, and Blendtec has even gone far enough to sue Vitamix for patent infringement. Blendtec won this lawsuit when a Utah judge ruled that Vitamix did copy Blendtec's designs, and Blendtec was awarded $24 million in damages in 2006. This lawsuit win was the largest patent lawsuit in Utah's history. In 2013 Blendtec won the Gold Innovation Awards for the company's Stealth and Signature Series blender lines. The latter features a powerful 1560-watt motor and the pitcher has a broad base. The pitcher on the basic version is 32 ounces, and the Wild Side pitcher is 44 ounces. When a pitcher has a wider base it's easier to get all of your smoothies or blended drinks out from under the blades. In addition to its powerful blender, Blendtec also features a warming feature for your soups and dips. Blendtecs tend to be more compact than those from Vitamix, and this makes it more convenient to take with you when you travel. However, the Blendtec does come with a few drawbacks that may be deal breakers for some people. Blendtecs do not come with an instrument to push your food things down to the blades (AKA a 'tamper'), so you do have to dice your food smaller to ensure it all gets to the blades and blends. It suffers from what I have decided to call the 'Goldilocks Defect' - while having a wider base may be nice for blending normal amounts of food, it has a slight problem with both small and large amounts. If you put a small amount in, the blades won't spin as much, and if you overfill it, the blades won't spin at all. The machines tend to be excessively loud. Finally, it comes with several pre-programmed settings, and this makes it hard to blend ingredients for dips or smoothies manually. Vitamix is a privately owned company that has produced high end blenders since early 1921. Vitamix began with a traveling salesman named William Grover Barnard who traveled the United States selling kitchen appliances. He wanted to invent a blender that focused on healthy living, and "Vita-Mix" was born. Vitamix's main competition is Blendtec, and Blendtec successfully sued Vitamix in 2006 for patent infringement. This company started the nation's first infomercials in 1949 to market the Vitamix, and it quickly caught on. By 1969, the Vitamix company released a blender that had the ability to knead bread dough, blend ice cream, make hot soup, and grind grain. In 1985, the Mix n' Match machine was debuted, and it became the first high-performance commercial blender available. Vitamix blenders come in a range of styles and sizes with multiple functions. The prices also vary wildly, but in general the Vitamix brand is one of the more expensive on our list. One of their popular models comes in at $650, but you can get a more basic factory reconditioned Vitamix for $330. The Vitamix blender comes with a 1380-watt motor and a tapered pitcher. The tapered pitcher is durable and comes in a 64-ounce size, and the blades run up to 240 miles per hour for extreme chopping and blending power. This blender is capable of blending nuts and seeds and breaking down frozen fruit for smoothies or ice cream. Its smaller motor means that it's a quieter option than several other blenders out there, and it's well made, so you'll be assured that it'll last for repeated use. The Vitamix brand does have a few downsides, but almost every blender brand does. The price for this brand is a huge downside for many people. Additionally, it doesn't have a heating function, and this can make it difficult to make heated soups or hot dips. The Nutribullet is one of the newer blenders on the market, and it is made by Homeland Housewares. This particular blender is sold in over 50 countries, and it has become stupendously popular. You'll also see it advertised heavily in a variety of infomercials. It also comes in several different styles and names all marketed under the "Magic Bullet" brand. Originally, the Nutribullet was designed to help people replace several bulkier household appliances like an electric juicer, blender, and a food processor. The base of the Nutribullet is a blender, and there are several useful attachments you can purchase for it including screw-on cross blade attachments, mixing cups, handled cups, and a full-size blender. The Nutribullet is one of the least expensive blenders in this comparison. A new one is around $130, but you can find them online for as low as $90. As this is a smaller blender, it has a smaller motor. The motor is around 600-watts, and this is almost half of what the Vitamix and Blendtec models have. Additionally, the pitcher is 24 ounces at its largest, though it is very versatile and durable. You can use this blender to grind seeds and nuts and blend small quantities of smoothies, dips, and a variety of dressings. This blender wouldn't be a good choice for things like ice cream or soups because you tend to need larger quantities, and this blender simply can't handle them unless you split it into two or more batches. There is also no heating element with this blender, and this can put people off. The Ninja blender is made by the company SharkNinja, and this company was originally founded in Canada in 1995 before moving to Massachusetts. SharkNinja's goal was to revolutionize the small appliance industry with highly functional, sleek, and innovative products. This blender is one of the most widely purchased, and it's commonly found in big box retail stores, or advertised online. The multiple blade system sets this blender apart from the others on our list, and the blades are positioned in the middle and on the top of the machine. This means you don't need a tamper to push your food toward the blades. The Ninja blender system is widely accepted to be the main competition for the Nutribullet blender system. The base of this blender comes with several easily programmable options, and it has a powerful 1,000-watt motor. The pitcher is slightly tapered along the bottom, and it holds 72 ounces. The Ninja blender costs between $80 to $120, with the higher priced models being faster. This blender is better suited for large amounts of liquids or smoothies. It won't be able to handle things like ice creams, thick smoothies, sauces, or some dips. 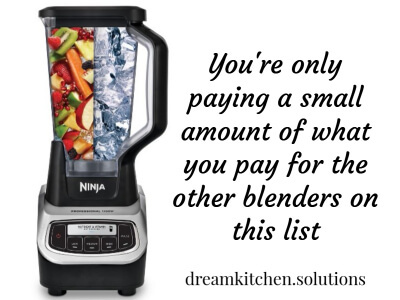 You're only paying a small amount of what you pay for the other blenders on this list, but you're also restricted by its capabilities. If you're planning on making thicker dessert dishes, you may want to look elsewhere. For anyone who makes a variety of dishes and drinks using a blender, it's better to look more a more multi-purpose machine. Any one of these blenders could work for you, but it's common sense that some will work better than others. Now that we've touched on the important points and showed you a quick comparison table of our top four blender picks, you should be able to make an informed decision about which blender is the best fit for your lifestyle. One of these blenders will fit your budget, and they're all high-quality devices in their own way. Personally I was lucky enough to be given an expensive Vitamix as a gift, and while it's noisy it's really powerful. I use it to make green smoothies. I find it easy to use and clean and would recommend it.